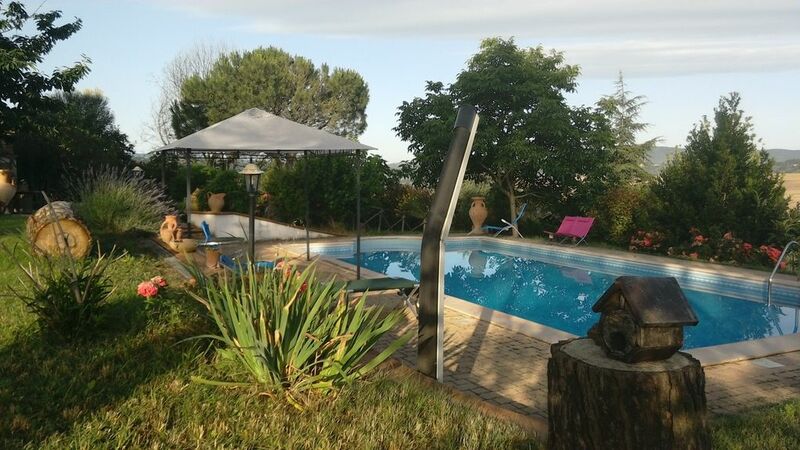 This chalet, located in Perugia, is ideal for 3 vacationers. It offers a bedroom, a private pool, an enclosed garden and WiFi. The chalet has a comfortable bedroom with a double bed. The bathroom is fitted with a shower and a toilet. The chalet features air conditionning, a washing machine, ironing equipment, a vacuum cleaner and cleaning products. Parking is available onsite and is private. Smoking is not allowed inside. Pets are allowed. Parties are not allowed. This chalet enjoys a privileged location that will allow you to enjoy your stay in the area. Many activities await you in the surroundings, such as Mountain biking, Ice skating, Swimming, Golfing, Cycling, Horse riding, Tennis, Roller skating and Windsurfing. You will also find great bars and restaurants at 30 m and a supermarket within 3 km. Santa Sabina golf course is 5 km away from the chalet.